Forum | PolishOrigins :: View topic - Now I know where I got my hospitality gene from. Now I know where I got my hospitality gene from. Posted: Mon Jan 04, 2016 3:01 pm	Post subject: Now I know where I got my hospitality gene from. 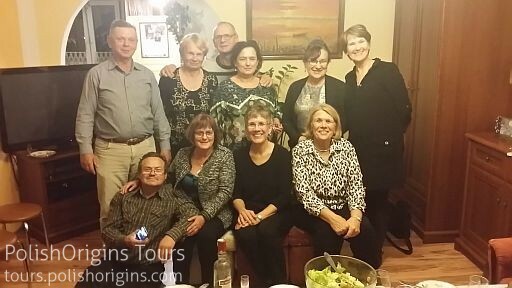 We start this New Year 2016 with new blog written by Karen who, together with her sister Kathy and sister-in-law Becky visited Poland three months ago: Now I know where I got my hospitality gene from. http://blog.polishorigins.com/2016/01/04/now-i-know-where-i-got-my-hospitality-gene-from/. "(...)"Once leaving the church we went to find the family that still farmed in Dlugokaty. We had no idea whether they would be home and if they were would they even care to meet with us. There is no doubt in my mind where I got my hospitality gene; it is definitely from my Polish side of the family. We pulled into a courtyard surrounded by a home on each end and an out building on each side. The dogs alerted the residents to someone being there and out of the smaller home came my third cousin Miroslaw. He invited us into the smaller home where the whole family was having dinner with his parents. They welcomed us with open arms, out came the desserts and coffee so we could have a little social time and discuss why we were there. His mother Elzbieta looked at me and said you look like us, which made me feel very welcome. After some time, a whole meal appeared on the table, perogies, golumpke, cutlets, etc. We ate like we hadn’t eaten in a while and shared stories translated by her grand-daughter Paulina and Zen.(...)" Read the whole story here: http://blog.polishorigins.com/2016/01/04/now-i-know-where-i-got-my-hospitality-gene-from/.